In the Fate series (I've only ever watched Fate/stay night anime, never played the game), I understand that servants are essentially just a reflection of their former self. 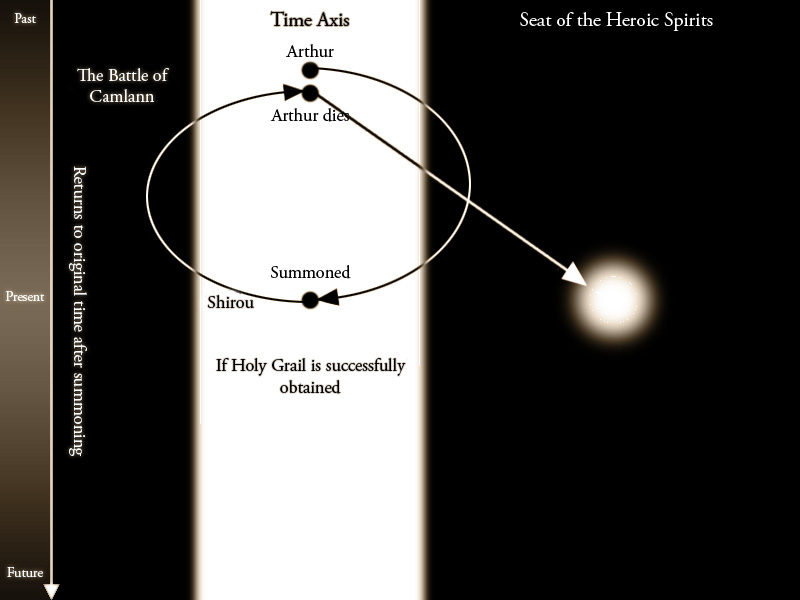 But in the case of Arturia (Saber) that actually is her, to my understanding, before she died she made a pact with The World to be able to be summoned as a Servant to seek the Holy Grail. But during the conclusion of the anime, she speaks of a dream and dies. I assume the dream she speaks of was about having met Shirou, but what about her participation in the fourth Holy Grail war? I'm just very confused about this scenario as a whole, can someone please help clarify this for me? After watching the series I feel that there's no real closure with her character. 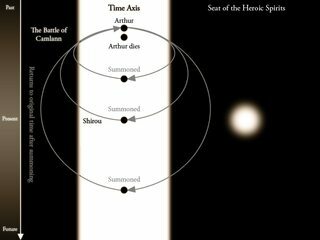 How Summoning normally works is that a clone of a Servant is made from the Throne of Heroes and this Clone, and their memories/experience/changes in nature (ie. corruption) are discarded so the original remains the same. the first image shows how Saber will return to the point in time before her death after each attempt at getting the Grail. the second image is what will happen when she completes her contract in which when she completes it she'll proceed to her death rather than before she died before then going to the Throne of Heroes. With the Grail gone and unable to maintain her form, Saber is sent back to the battlefield of Camlann, as she remembers the words of Lancelot and Rider. also in the Heaven's Feel Route after their run in with Ilya and Beserker, Shirou is confused as to Ilya's hostility to him. Saber contemplates as to whether to explain this to Shirou but instead telling him to seek out Kotomine despite wanting to have as little contact with him as possible due her own personal dislike for her former Enemy Master. before Shirou enters the church (leaving Saber outside) she suggests not to reveal that she's been summoned again. As for what other memories she would have in -Last Episode- we can assume that it's only what she would remember by the end of the Fate Route (including her previous attempts) as since in the Fate Route her contract is terminated due to it being her choice to destroy the manifested Holy Grail and accepting her appointment as King any further attempts would not be known to her. since the Throne of Heroes is disconnected from the rest of the universe allowing the summoning of "heroes" from other timelines (Archer in Fate/Stay Night is the perfect example) there is a high probability that an Arturia would end up there. however since she would have memories of previous Holy Grail Wars/Attempts probably the only way to tell you have summoned Arturia herself or a clone is to ask if she ever got a Holy Grail before. as a final note, since Fate/Labyrinth was made well after Fate/Stay Night and without knowing when in Arturia's own timeline she would have shown up there (ie. would she have remembered Waver from the 4th War as Waver would remember her?) i would speculate that in the Fate Route she wouldn't have any memories of the events in Fate/Labyrinth.